W:. 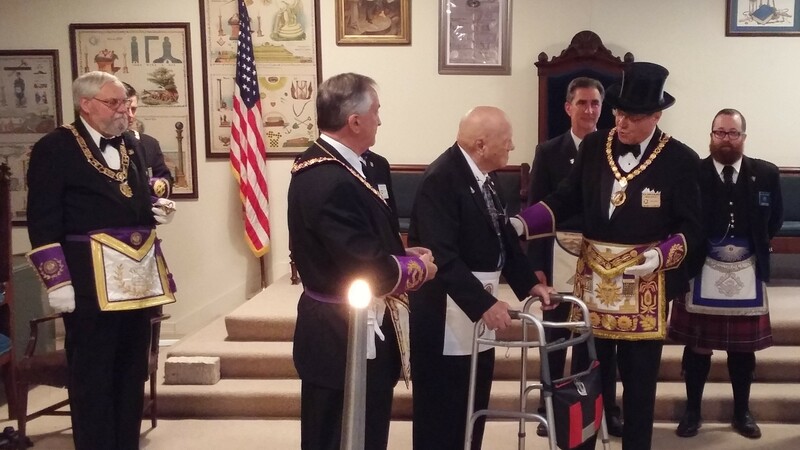 Fred Kraser received his 70th Year Apron from M:.W:. Jeffrey M. Williamson on October 14, 2017 at Wappingers Lodge #671. The event was witnessed by approximately 80 brothers, family members and friends. Both the Grand Master and Deputy Grand Master, R:.W:. William Sardone and the officers of their lines were in attendance. 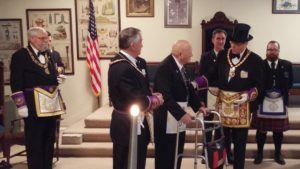 Master Ian MacGregor and Brothers from Shekomeko and Mount Kisco Lodges to which Worship Fred belongs were in attendance, along with Arthur H. Pritchard Jr., Dutchess District Deputy Grand Master, R:. W:.Clinton E. Allen, Grand Staff Officer, Richard Hawthorne, Assistant Grand Lecturer, W:. William Settembrino, Wappingers Lodge #671 and several family members. R:. W:. John Anderson, his wife and others provided a luncheon, which was enjoyed by all.